NASA’s Cassini spacecraft has observed Titan in the supersonic and super-Alfvénic solar wind, revealing that Titan’s interaction with the solar wind is in many ways similar to unmagnetized planets Mars and Venus and active comets in spite of the differences in the properties of the solar plasma in the outer solar system. Titan is large enough that it could be considered a planet if it orbited the sun on its own, and a flyby of the giant moon in December 2013 simulated that scenario, from Cassini’s vantage point. The encounter was unique within Cassini’s mission, as it was the only time the spacecraft has observed Titan in a pristine state, outside the region of space dominated by Saturn’s magnetic field, called its magnetosphere. Titan spends about 95 percent of the time within Saturn’s magnetosphere. But during a Cassini flyby on December 1, 2013, the giant moon happened to be on the sunward side of Saturn when a powerful outburst of solar activity reached the planet. 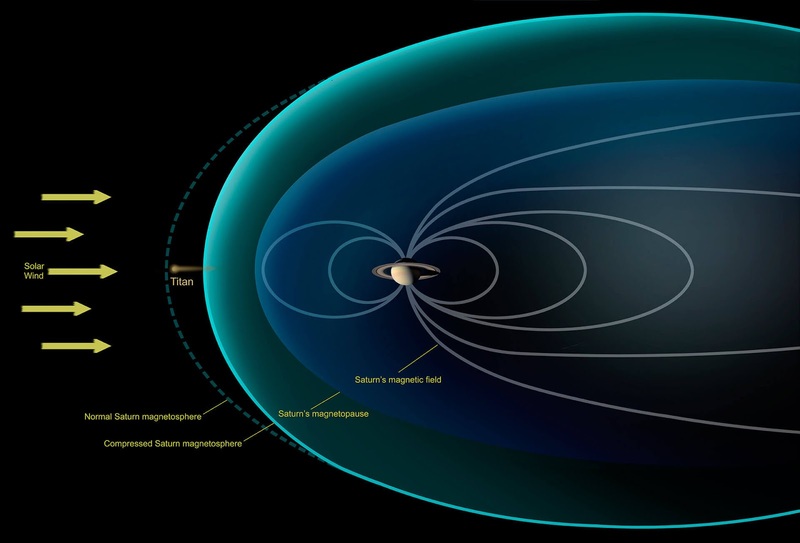 The strong surge in the solar wind so compressed the sun-facing side of Saturn’s magnetosphere that the bubble’s outer edge was pushed inside the orbit of Titan. This left the moon exposed to, and unprotected from, the raging stream of energetic solar particles. The new research is published today in the journal Geophysical Review Letters.